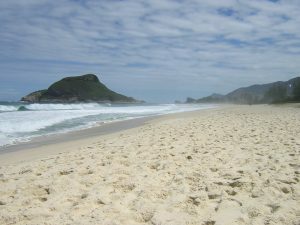 On a weekday many beaches like Recreio are almost deserted, photo by Hakan Almerfors. RIO DE JANEIRO – Copacabana and Ipanema are beaches famous around the world, but there are plenty more to discover in Rio de Janeiro. Here is a collection of beaches that are known and frequented by few tourists but well worth a visit. The best time to go is weekdays, weekends get very crowded and the traffic situation then is bad. Praia Vermelha This beach is wedged in between two huge boulders of rock right at the base for the Sugarloaf cable car. Combining a trip to the top with some beach time is a nice afternoon itinerary. The ocean is often quite clean here so bring swimming gear. There are a few places to eat, especially if you walk the kilometer to the other side of the rock – one is the famous Bar da Urca on Rua Cândido Gaffrée 205 where you have a beautiful view of Guanabara bay. Praia do Leme This one is for the families. Beautifully located next to the green rock Morro de Leme on the northern end of Copacabana. The ocean is normally calmer and with less currents which make it quite safe. It has a lot less scoundrels than on Copacabana beach and a nice local feel. Praia do Diabo Located next to the rock in Arpoador on the eastern end of Ipanema. A small beach with a open view of the sea. A great place to play beach tennis, volley ball or surf. Swimming not to recommend due to dangerous currents. 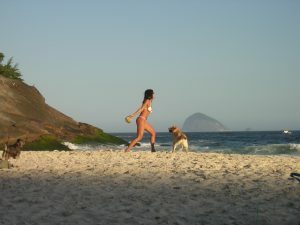 Praia do Vidigal – Hotel Sheraton Located right at the foot of the hotel. The water is not always clean but the setting is great, it was used for scenes in the film “Cidade de Deus”. Accessible by going through the hotel or by an improvised staircase on the side. Bring something to eat since there are no restaurants. Joatinga is a beach frequented mainly by residents, photo by Hakan Almerfors. Joatinga Quite hard to find but well worth the effort. A car is needed to get there. Going from Zona Sul to Barra de Tijuca passing by Rocinha and São Conrado, there is an exit for Estrada de Jóa on the right, that road will climb the hill. After about 10 minutes there is an entrance to a secluded area on the left, the street is Rua Pascoal Secreto (click for Google Map). Ask the guards to let you in and follow the road to the end. The descent to the actual beach is quite steep. This is a good place for body boarding and sometimes surfing. There are no places to buy drinks or food. Recreio and Macumba Barra de Tijuca connects with a neighborhood called Recreio on a 18 km stretch of beach. On weekdays big parts of this big bend is deserted. On the western end you have a big rock separating Recreio beach from Macumba beach. Both are really beautiful, the latter has calmer parts better for taking a dip. A car will give you access to the whole stretch, and by bus from Zona Sul, like S-20, you can reach the end with the rock. There are quiosques with food and drinks. Avoid weekends since it gets really crowded. Grumarí Past the surf beach Prainha lies this beautiful beach (click for Google Map). On weekdays it is almost deserted while on weekends crowded. No restaurants or places to buy drinks, and a car is needed.